Hello, Lovlies. I’d like to introduce myself before we get started with the fashion talk. My name is Diana Hernandez, the face behind forthelovelydays.com. I’m a mommy blogger and I blog about a variety of things such as: baby, motherhood, beauty, fashion, & lifestyle. YEAH I KNOW, that’s a lot! I simply enjoy writing about my different passions, experiences, and purchases. I also feature & review. I’m a stay at home mama, living a wife life. Kaden, my son of 6 months, stays home with me all day, every day. My husband, David, is the greatest support system I have had since I started my blog (2 months ago). I’m truly grateful for all my lovely viewers & hope I can inspire others to follow what they love and do it. I’ve had a passion for fashion since grade school. I always kept up with modern trends, and during my senior year I actually won the Best Dressed Senior Superlative. Now that I am a mother, I have been more focused on keeping up with baby fashion. One of my absolute favorite trends right now are BIBDANAS. They are fashionable, hip, and very convenient. We know that our babies & toddlers can be very messy at times, especially if your baby is teething. These bibdanas prevent your little one from drooling on their clothes, eliminating stains on your favorite attire. You’ll come across a few shops that actually attach a pacifier holder on the back as well. 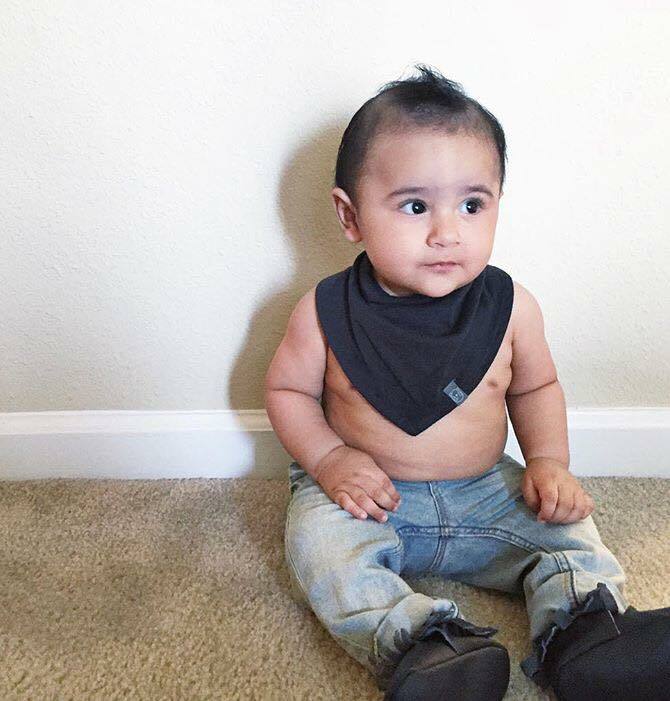 These fashionable bibs are mainly worn as accessories for daily outings and definitely top off the outfit perfectly. I highly recommend these to all. The designs are so modern & cute and they’re not expensive either, which is a great plus! Some of the best bibdana shops I’ve stumbled upon are See Luna Run, Little Elle Love, & The Littles Collection. They are all available online. I have styled a couple below to give you an idea of how fashionable BIBDANAS are! LOVELY FASHION FOR LOVELY LITTLES!